A life jacket, also referred to as a life vest or personal flotation device (PFD), is an ESSENTIAL piece of gear for boating, fishing, and various water sports. It’s designed to keep the wearer’s head above the water, either in a vertical of face-up position depending on the type. Many people think it’s enough to simply “have” a PFD nearby but the reality is that most drownings occur when a life jacket was available to the victim but they chose not to wear it. – An adult can drown in as little as 60 seconds; only 20 seconds for a child. – 90% of drownings take place in inland waters; only a small fraction drown out at sea. – In 2012, 70% of boating fatalities were due to drowning; 85% weren’t wearing a PDF. – The majority of those who drown know how to swim. Think all life jackets are big, ugly, and uncomfortable? Think again! Designs have come a long way over the years as research and technology has allowed manufacturers to make radical design changes to add comfort and style while reducing the bulk and weight. Today’s life vests really are easy to wear. Because a life jacket is not one-size-fits-all, there are styles available for specific uses and activities including: boating, sailing, fishing, kayaking, and other water sports. While it’s not necessary to own a separate PFD for each activity, there are definitely advantages if you do a lot of a single activity. The United States Coast Guard (USCG) requires that each recreational boat has one wearable life jacket available for each person on board. While it’s not federal law for adults to be wearing one while boating, if you really think about it, it’s not a “life” jacket unless you are wearing it. For water sports such as personal watercraft operation or water skiing, a life jacket is typically required to be worn in most states. Of course, some states may have slightly different laws so it’s best to be familiar with those in yours. 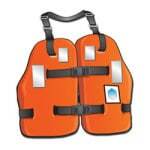 With children, federal law states that persons under 13 years of age who are on a moving boat, must be wearing a properly fitted US Coast Guard approved life jacket. State laws may vary in terms of age so be sure to check with your state’s office if you are not sure. In addition, certain types of life jackets may be required for some ages. Simply put, a life jacket adds additional buoyancy (or floatation) to the wearer while in water. While it doesn’t seem like much, a typical adult needs only an extra 10 pounds or so of buoyancy to keep their head above water. All things considered, fit and muscular individuals will need more buoyancy than those with a high bodyfat percentage. Other factors that determine the amount of buoyancy needed are lung size, water conditions, and clothing being worn. Inherently buoyant – Offers floatation without having to inflate anything. This is by far the most common style of life jacket for kids and adults and will float on its own with the help of a material like foam. Bulkiest out of the three but provides the most reliability. Inflatable – This type has a chamber that is filled with air. Manual and automatic inflation is available. Inflatable life jackets should not be used by anyone under 16 years old. While it’s the most compact, it requires regular inspection and is only intended for swimmers. Snorkel vests with manual inflation also fall under this category. Hybrid – Consists of a buoyant foam material as well as an inflatable chamber. Not too common. Considered reliable but expensive and requires regular inspection. A Type 1 life jacket provides the most reliable floatation and highest amount of buoyancy. It’s the best type for off-shore use which includes open waters, rough seas, or remote locations where immediate rescue may not be possible. Also recommended when boating or fishing alone and far from shore. Type 1 PFDs are designed to turn almost all unconscious wearers face-up and allow the user to retain the most body heat due to the additional foam and fabric. Almost always designs with bright colors, many also have reflective strips to help in case of search and rescue. The biggest downside is they are typically bulky and somewhat uncomfortable. Type 2 life jackets are intended for use on calm waters when fairly close to shore and immediate rescue is a good probability. Great for fishing, sailing, boating. They offer less buoyancy than a type 1 but are much more comfortable. Type 2 PFDs are normally the best choice for children (infant and older) unless far away from shore. In fact, some states require a type 2 for children under a certain age. While this type will turn some unconscious wearers in a face-up position, it will do so for most children since their weight requires less buoyancy than adults. Negatives include them not being suitable for long hours in rough water and many adults will still consider them slightly uncomfortable. A Type 3 life jacket is more lightweight and comfortable than a type 2 yet offers the same amount of minimum floatation. Unlike a type 1 or 2, it will not turn an unconscious wearer face up in the water so it might not be suitable for some children. In some cases, the wearer may need to tilt their head back to avoid being face down in the water. A type 3 life vest or floatation aid is by far the most popular for adults because of how comfortable it is to wear and it’s perfect for general boating, canoeing, kayaking, and most watersports. Many of the best life jackets are type 3. A Type 4 is not even a life jacket but instead a device that is designed to be thrown overboard to someone who may be in trouble but still conscious. They are not intended for rough waters. Most people would recognize a type 4 PFD as a ring buoy but it may also come in the form of a seat cushion or horseshoe shaped buoy. So what is the main advantage of a type IV PFD? Well, they are cheap insurance that can be stored in boats if needed. They are intended to be used as a back-up to wearable life jackets and should always be within easy reach for available use on a boat. Per USCG rules, these are not required on kayaks or canoes. Type 5 personal floatation devices are intended for very specific activities or conditions. These devices may include a deck suit, float coat, commercial white water vest, or paddling vest. Type 5 PFDs may also be available in windsurfing, kayaking, water skiing, and hybrid vest varieties. It’s very important to check the label to see the limits for its use as this labeling is required by the USCG. Most people will never need to use one of these. Buying the right size life jacket is extremely important. Sizing is measured differently in adult and child sizes. Proper fit means that the life jacket fits snuggly yet allows free movement. If a PFD is too small, the wearer’s mobility may be limited. If one is too large, it may cause the wearer to have to work harder to stay afloat and maybe even keep the jacket from falling off. Below are sizes to be used as a general guide. While kid’s sizes are fairly universal, adult sizes may vary slightly based on the manufacturer. Child life jacket sizes are based on weight and are one size fits all for that weight range. There can be overlap between some particular models so we may for example recommend a “child” size model for a toddler based on feedback from parents. When looking to buy, you may think that life jackets for babies would be cheaper since they are smaller but that is usually not the case. This is mainly due to additional features such as padded head support, handle on the back, and crotch strap being added. All very important safety features for the littlest ones. While women can following the same sizing guidelines as above, there are life jacket styles and models intended specifically for them and we actually recommend women-specific PFDs over unisex styles in most cases. Some small differences such as princess seams or contoured cups for larger bust lines may provide a much more comfortable fit. Obviously, measuring chest size is still important as with any life jacket for adults. Many dogs absolutely love being in the water and are naturally very good swimmers. The problem is that they will eventually get tired and can get into trouble just like people. While golden retrievers and labradors may get all recognition in regards to swimming, most dog breeds also do just fine. Manufacturers understand that dog owners consider their pets as part of the family so big money now goes into research and development and proper sizing. Some of the better life jackets for dogs come in a variety of sizes so no matter if you have a yorky, boxer, or german shepherd, a correct fitting vest is available. Undo all the straps, put on the life jacket, and zip it up. Tighten all the straps. Begin at your waist and work your way up. If there are shoulder straps, they should be tightened last. You’re looking for a snug fit but still comfortable. Have another person grab the shoulder part of the life jacket and pull up. It should not go past your nose or head. If it does, tighten the straps some more. Simulate the movement or position you will most likely be in whether it’s paddling or sitting on a jet ski. You want to make sure you have free, comfortable movement and no chafing. If at all possible, use a pool or shallow water to test your life jacket to see how it feels. While floating, it shouldn’t ride up much or go over your chin. If it does, it may be too big. Check the buoyancy by relaxing your body and tilting your head back. Your chin should be comfortably above water to make breathing easy. Pockets – Both for convenience of storing small items or warming your hands. Segmentation – Blocks of foam inside the life jacket are cut in a way to allow the jacket to have a higher range of motion than others. While they are more expensive to manufacture, they are noticeably more comfortable. Color – Bright colors allow the wearer to be seen more easily when in trouble. Tabs – Let you attach various accessories including knives, strobes, tools, or whistles. Mesh Drain Panels – Allows a vest to drain water and dry quicker. Fishing Holders – Loops for fishing rods, tool hangers, and lure/fly holder add convenience. Reflective Tape – Better visibility in conditions of low visibility. Zipper and Buckle Quantity – A higher quantity of these allows for better customization and fit. Over time, the amount of buoyancy your life jacket offers decreases. Taking good care of your PFD is a simple but often overlooked item. Here are some tips to make sure it’s operating at optimal performance since your life really does depend upon it. Check the general condition and working order of all hardware and straps before going out on the water. Check for leaks (inflatable/hybrid versions), lumpy buoyancy material, mildew, and tears. Replace life jackets which exhibit any of the issues above. Keep out of direct sunlight for extended periods. Rinse off after each use. Allow it to dry thoroughly before storing it away. Store it in a cool, dry area with plenty of ventilation.